In the summer of 2008, in the midst of the financial crisis and in an environment of restricted credit for U.S. utility-scale renewable energy projects, BNB launched its distributed-generation efforts to pursue onsite renewable energy development with quality-rated Fortune 500 companies. In January 2009, BNB was retained by Campbell Soup Co. to analyze its U.S. facilities and help determine which ones were suited to onsite renewable generation. We identified six potential sites, and Campbell prioritized one of them for immediate development: its production facility at Napoleon, Ohio, the largest food-production facility in the world. BNB subsequently developed a 9.8MWdc solar array on that property. At the time it was commissioned, in December 2011, it was the largest inside-the-fence solar array built for any U.S. corporation, supplying 15 percent of the plant’s annual energy needs. The ground-mounted, single-axis tracking system was manufactured by San Jose-based SunPower, which also provided engineering, procurement and construction services. Shortly after commencement of construction, BNB executed a co-development agreement with Enfinity America Corp., which, along with Wells Fargo, provided term financing for the project. 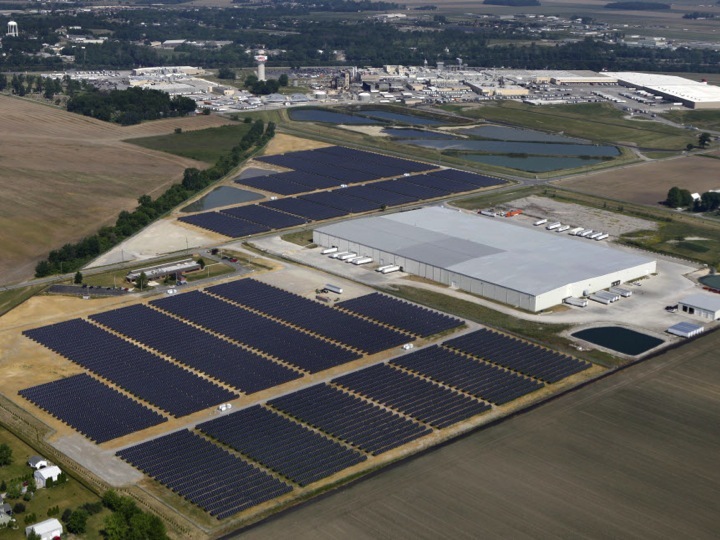 FirstEnergy Solutions, of Akron, Ohio, purchased all of the Solar Renewable Energy Credits (SRECs) produced by the array, and Campbell Soup Co., through a 20-year power purchase agreement (PPA), purchased 100 percent of the power generated. Based on U.S. Department of Energy projections, Campbell estimates that, over the course of the PPA, it will save about $4 million on electricity costs and eliminate 250,000 metric tons of CO2.